Autumn with chocolate wrapper! 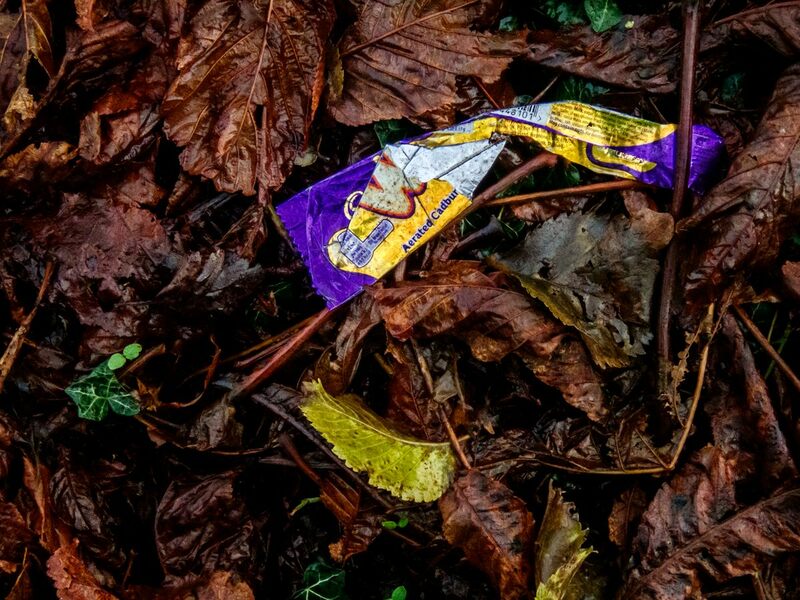 Maybe the last of this autumn mini series … well, it was taken just after the end of meteorological autumn but, apart from the wrapper, we are looking at autumn’s debris – in fact this was again taken beneath the huge Horse Chestnut tree in Church Lane, like this earlier shot . 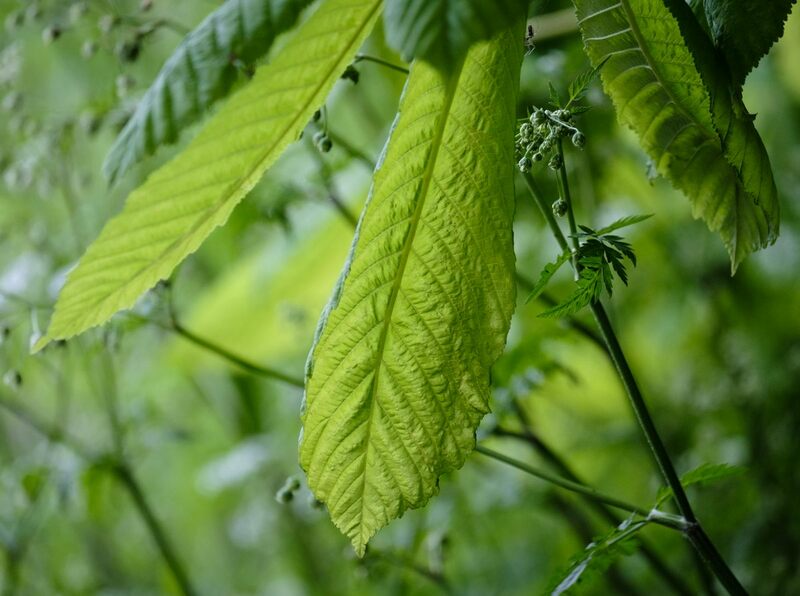 The chocolate wrapper drew my eye because its curved shape is taken up by the bright green leaf below it, to almost form a semi-circle. And the carpet of dead leaves is richly coloured and glistening: everything had been drenched by overnight rain. The small bright green leaves at lower left help balance the composition: cover them with your finger to see what I mean. And there’s also the inverted ‘V’ shape made by the long, thick, brown twigs that intersect (one above, one below) with the right hand end of the wrapper. 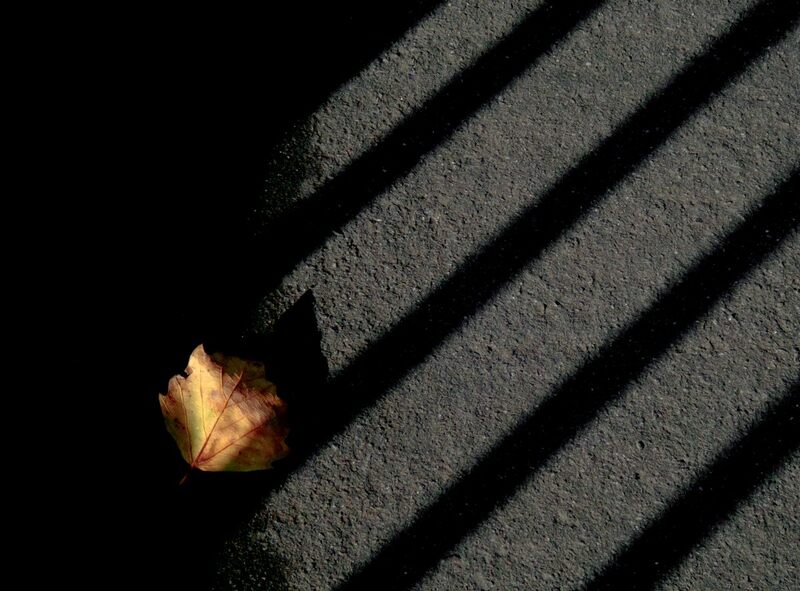 There are earlier autumn posts here: 1 2 3 4 5 6 7 8 9 . Each will open in a separate window. The first image in the Outer Suburbs series, with context, is here: 1 . Subsequent images are here: 2 3 4 5 6 7 8 9 10 11 12 13 14 15 16 17 18 19 20 21 22 23 24 25 26 27 28 29 30 31 32 33 34 35 36 37 38 39 40 41 42 43 44 . Each will open in a separate window. Technique: TG-5 at 100mm (equiv); 1600 ISO; Lightroom, using the Camera Natural film simulation; south Bristol; 3 Dec 2018. Along the roadside, on a cold morning. The first image in the Outer Suburbs series, with context, is here: 1 . Subsequent images are here: 2 3 4 5 6 7 8 9 10 11 12 13 14 15 16 17 18 19 20 21 22 23 24 25 26 27 28 29 30 31 32 33 34 35 36 37 38 39 40 41 42 43 . Each will open in a separate window. Click onto the image to open another version in a separate window, and click onto that image to enlarge it further – recommended. Technique: TG-5 at 57mm (equiv); 1,000 ISO; Lightroom, using the Camera Vivid film simulation; Silver Efex Pro 2, starting at the Strong Infrared Low Contrast preset and adding a light selenium tone; south Bristol; 22 Nov 2018. 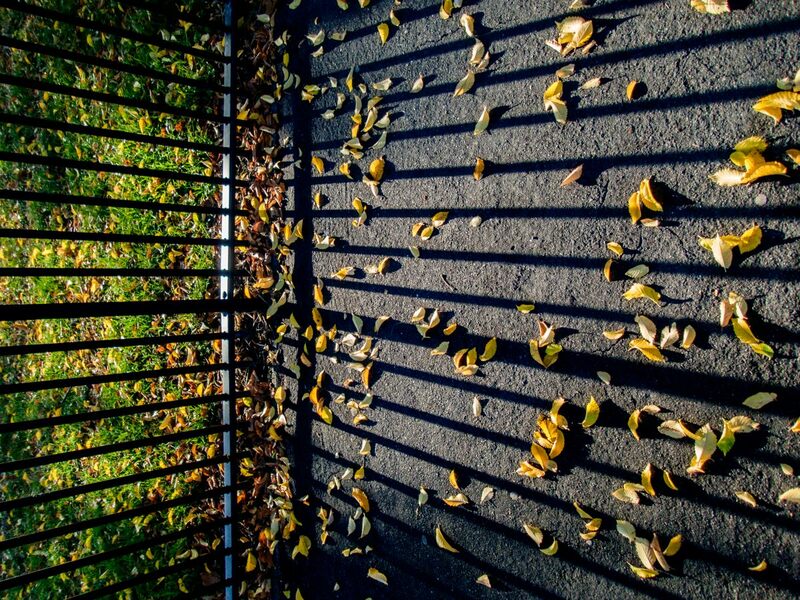 Autumn at the park: a wideangle view of the park’s railings and their shadows, with the park’s grass on the left and the pavement outside the park on the right; original camera angle. Get inside this image >>> click onto it to open a larger version in a separate window, and click onto that image to further enlarge it – recommended. 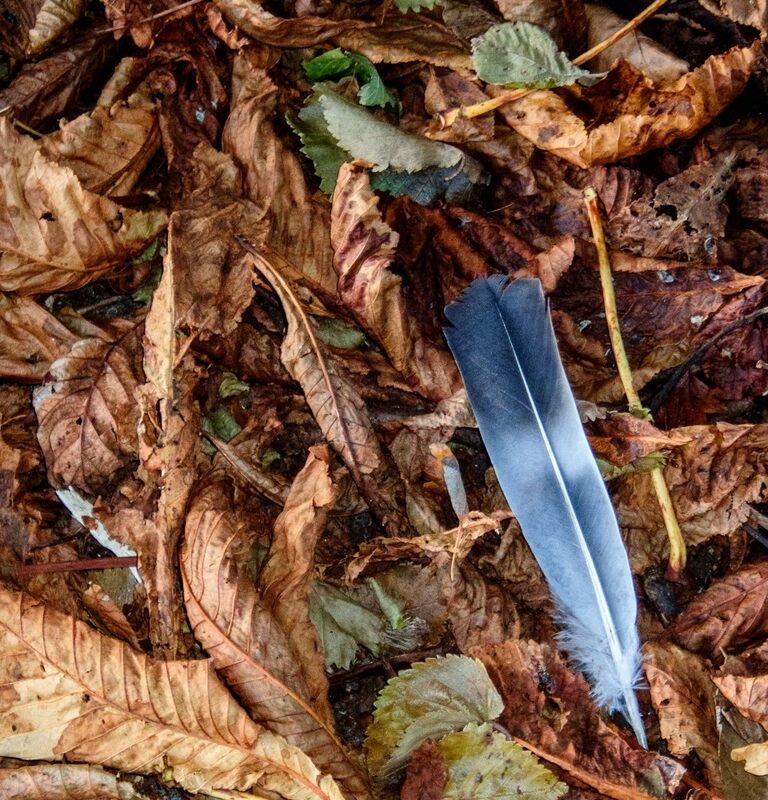 There are earlier autumn posts here: 1 2 3 4 5 . Each will open in a separate window. The first image in the Outer Suburbs series, with context, is here: 1 . Subsequent images are here: 2 3 4 5 6 7 8 9 10 11 12 13 14 15 16 17 18 19 20 21 22 23 24 25 26 27 28 29 30 31 32 33 . Each will open in a separate window. Technique: TG-5 at 25mm (equiv); 250 ISO; Lightroom, using the Camera Vivid film simulation; south Bristol; 10 Oct 2018. 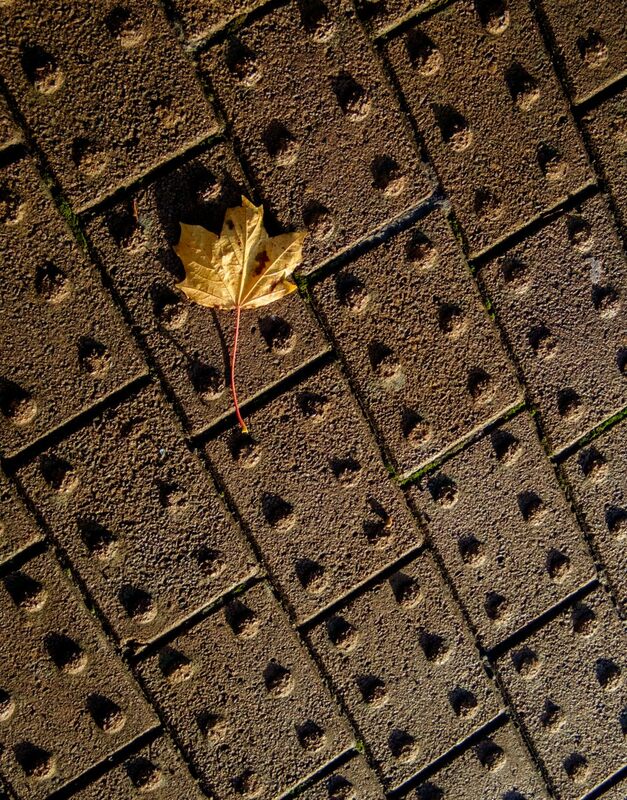 Autumn on the pavement. Beside the park railings. Caught by the rays of the rising sun. There are earlier autumn posts here: 1 2 . The first image in the Outer Suburbs series, with context, is here: 1 . Subsequent images are here: 2 3 4 5 6 7 8 9 10 11 12 13 14 15 16 17 18 19 20 21 22 23 24 25 26 27 28 . Each will open in a separate window. Technique: TG-5 at 100mm (equiv); 250 ISO; Lightroom, using the Camera Vivid film simulation; south Bristol; 10 Oct 2018. 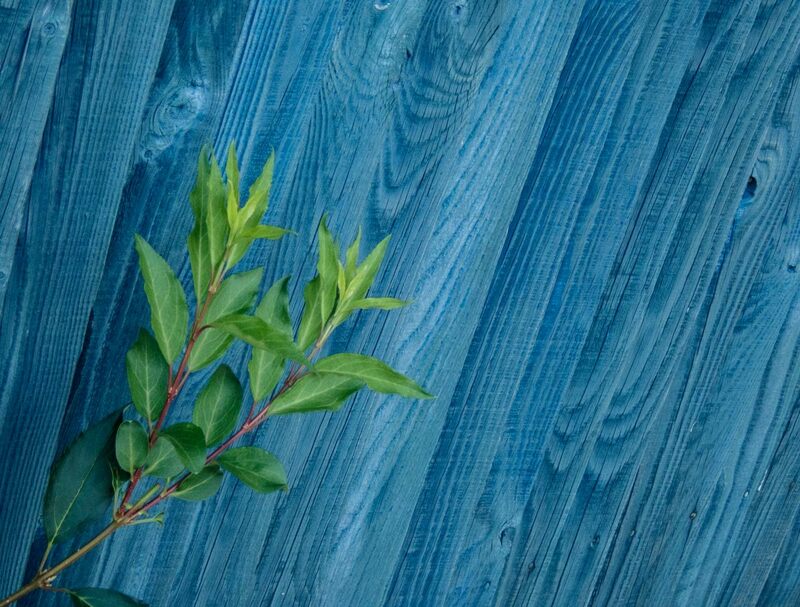 Green leaves against a blue fence, rescued for posterity – days later, a tidy householder had decided that this living thing was making the place look untidy, and duly sent it to meet its (probably none too pleased) Maker. There are earlier Street Scene posts here: 1 2 . Each will open in a separate window. The first image in the Outer Suburbs series, with context, is here: 1 . Subsequent images are here: 2 3 4 5 6 7 8 9 10 11 12 13 14 15 16 17 18 19 20 21 22 23 24 . Each will open in a separate window. Technique: TG-5 at 91mm (equiv); 800 ISO; Lightroom, using the Camera Natural film simulation; south Bristol; 31 Aug 2018. 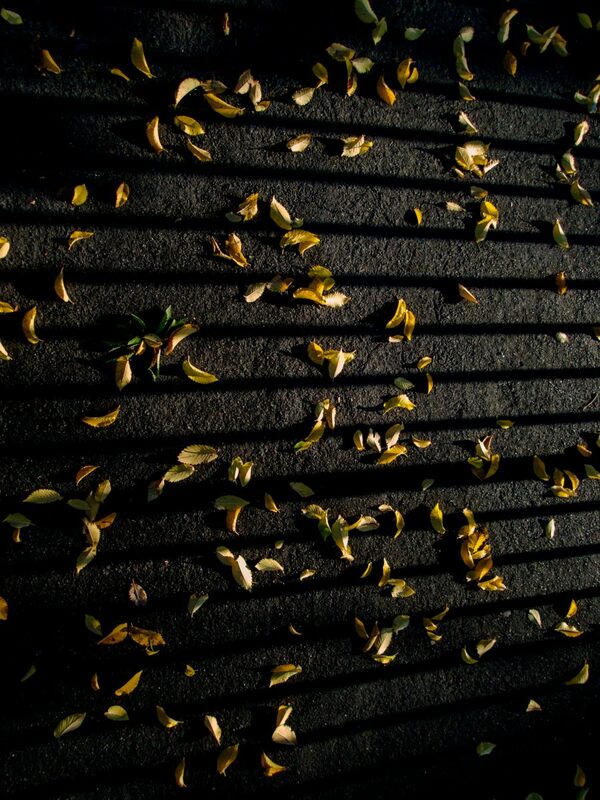 Pavement with autumn leaves, sunrise, and the shadows of railings. The first image in the Outer Suburbs series, with context, is here: 1 . Subsequent images are here: 2 3 4 5 6 7 8 9 10 11 12 13 14 15 16 17 18 19 20 21 22 . Each will open in a separate window. Technique: TG-5 at 25mm (equiv); 250 ISO; Lightroom, using the Camera Vivid film simulation; rotated 90 degrees right; south Bristol; 10 Oct 2018. Water Lilies in the North Drain, Tealham Moor, on the Somerset Levels; 25 July 2009. I like the Minimalism here – just thin, green plants against a dark background – looking almost as if they are floating up into the air on a dark night! And then there is the way the leaves weave a sinuous line back through the picture, and the increasing dimness of the stems of those further away. Technique: D700 with 24-120 Nikkor lens at 120mm; 200 ISO; spotmeter reading taken from the nearest leaf. This is probably the last of my pictures from Church Lane in spring, at least for the present. 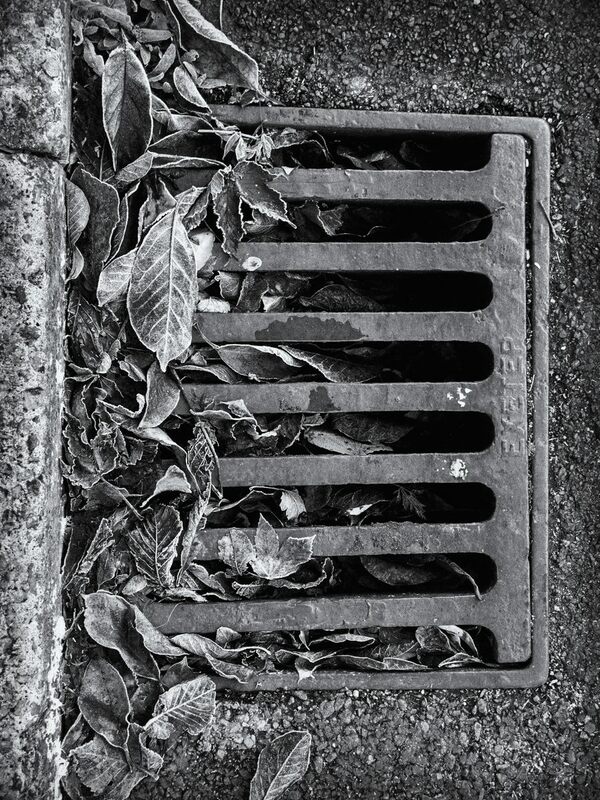 And, concluding where I started, this is the image that started me off photographing there in the first place. I was there on a beautiful spring morning, standing below the huge Horse Chestnut tree, and I looked through the viewfinder, saw this scene – and was instantly hooked on the exploding mass of greenery around me. Other images from these two springtime morning shoots in Church Lane can be found via these links: with context, here; also here and here and here ! Technique: X-T2 with 55-200 Fujinon lens at 305mm (equiv); 800 ISO; Lightroom, using the Pro Neg Hi film simulation; Church Lane, Whitchurch, Bristol; 4 May 2018.